Someday, perhaps, NFL players, coaches and fans will be able to thank the 2012 replacement refs for one thing: The lingering effects of the replacements' final call may forever keep NFL owners from messing with the real officials again. Whether the "Fail Mary" call at the end of the Seattle Seahawks' controversial win over the Green Bay Packers on Monday goes down as the worst officiating error in NFL history is an interesting discussion. More important, it was the moment when NFL owners finally came to their senses and realized that public confidence in their product was on the line by using substandard officials. By Wednesday night, the league and the officials worked out an eight-year deal. The league gave in on a couple of key issues, including the extension of pension benefits for another five years, and significantly raised the amount of money it was offering for officials. 1. The Fail Mary: The replacements saved their worst for last. The final call of Week 3 this season was the game-ending interception thrown by Seattle quarterback Russell Wilson. Somehow, even after replay, Wilson's pass, which was picked off in the end zone by Green Bay's M.D. Jennings, was ruled a touchdown catch by wide receiver Golden Tate. That play set off a firestorm of criticism of the league. 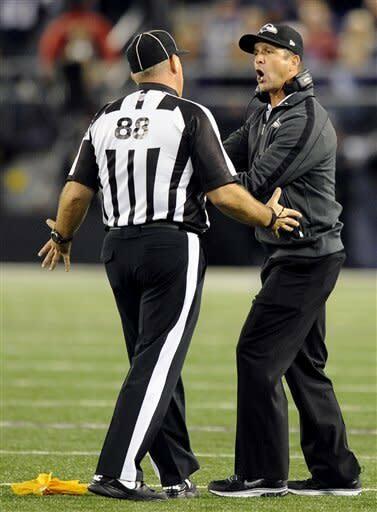 Ultimately, fans were no longer talking about the game, but the refs. 2. The 27-yard penalty: This was another error that occurred in Week 3. In the overtime of the Tennessee Titans' win over the Detroit Lions, officials marked off a 15-yard penalty for a personal foul against the Lions. However, instead of marking it off from the Tennessee 44-yard line, they marked it off from the Detroit 44. The 12-yard difference helped set up the Titans for what became the game-winning field goal. 3. The six-minute delay: Procedural errors by the refs, such as the one listed above, were the most consistent problem and did much to drain the confidence of players, coaches and fans. In the Week 3 Monday night game between the Denver Broncos and Atlanta Falcons, there was a fumble in the first half resulting in a fairly common scrum for the ball. However, this time it was apparent that the refs lost control of the game because players and coaches were coming off the sidelines. Pushing, shoving and screaming ensued. After six minutes of real time, the replacements finally restored order, but they never got their dignity back. 4. The 11-yard defensive holding: Later in the Falcons' win over Denver, Atlanta was called for a defensive-holding penalty in pass coverage. That's supposed to be a five-yard penalty and an automatic first down. Instead, the refs marked off 11 yards, not only mistaking the call as the 10-yard college rule, but also marking off the penalty from the wrong spot. 5. Fan on the field: In Week 2, Brian Stropolo was set to be a side judge in the New Orleans Saints-Carolina Panthers game. The problem was the NFL's failure to discover that Stropolo was a Saints fan. There were pictures of Stropolo on his Facebook page in Saints regalia and also sitting in front of the Superdome on game day. Not good. The only thing that kept Stropolo from taking the field was an alert report from ESPN's Chris Mortensen. 6. A fine mess: New England Patriots coach Bill Belichick's hands-on approach with an official at the end of the Sunday night game against the Baltimore Ravens earned him a $50,000 fine. While Belichick certainly looked angry at the moment, he later explained that he was looking for an explanation on what happened on the final, game-winning field goal. That's fair to ask for, although touching an official is verboten. But in the grand scheme of things, Belichick's fine was the biggest of four handed out to coaches in the first three weeks, which is a stunning pace. Belichick was joined by Washington Redskins offensive coordinator Kyle Shanahan ($25,000), Denver Broncos head coach John Fox ($30,000) and Denver defensive coordinator Jack Del Rio ($20,000), who were all docked for verbally berating the refs. 7. Phantom challenge: In another Week 3 gaffe, San Francisco 49ers coach Jim Harbaugh was able to convince the officials that he should be allowed to challenge a fumble call at the end of the 49ers' loss to the Minnesota Vikings even though Harbaugh had just called his final timeout. After the game, the official admitted the error, which was at least honest. Unfortunately, that's the only positive thing about that scenario. 8. The ref got paid: We repeatedly hear fans suggests that the refs were paid by one team. This time it really happened, although it didn't impact who won, thankfully. In the season opener between Seattle and the Arizona Cardinals, one of the refs in the game had been paid during the offseason to work Seahawks practices. That fact was never disclosed to the league and didn't come to light until Week 2. Fortunately, the Cardinals won the game. 9. Premature ending: To be fair, not even the San Diego Chargers and Oakland Raiders players, coaches or broadcasters watching this game realized the problem, so it's hard to get too worked up at the replacement ref. However, this play from the opener became typical. On the final play of regulation, San Diego punted to Oakland. As the punt rolled and the clock ran out, Charger players downed the ball at the Oakland 5-yardline. Because San Diego was the first team to touch the ball, the Raiders should have been given a final, untimed play. It would have taken a miracle 95-yard play for the Raiders to tie the game, but that's not the point. 10. Failure to tack on yardage: On at least two different occasions, officials failed to follow rule administration after defensive holding calls. Instead of adding the yardage to the end of play when the offense gained yards, the officials simply marked off the penalty from the original line of scrimmage.